I am thrilled to report to you Ken's newest level 50 Elf. You may have seen him hunting around the Valakas lair area in Fire Valley. 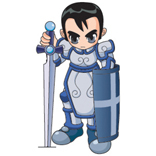 Yes you guessed it, he's SkyValiant from the pledge OceanPower. This elf has been playing Lineage for about 5 years. He migrated from Depardieu to Ken server and has been playing there since. He heard of Lineage from various websites on the net. He says his character is hard to level for many reasons due to his stats. Sky is a water elf with 16 CON and 15 WIS. He says these stats make his character hard to level, because of the low HP. The relatively balanced MP does make up for the disadvantages he says. You can usually see him in Baphoment morph with -43 ac and wieilding a +8 Blessed Katana. 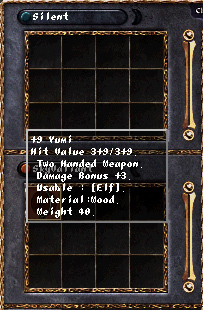 When he's in the mood for long-range fighting, he wields a +9 Yumi with -49 ac. When he was asked to choose from a Banana or Apple, he said Apple. The reason for this choice implied that apples are healthy! 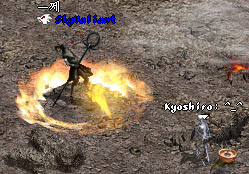 Sky's favorite boss is the Death Knight and Phoenix. He got his 1st drop that was worth over 1 million adenas from the Death Knight. The drop was a STR amulet. Sky would like NC to remove all the laggy problems in Lineage, because it's the only way people can enjoy the game. A huge shout out goes to ChanelN5, Channal, all friends from DD, and all Anti DD pledges for making sieges fun. �S� senor! Nice interview, but i'd have to agree w/ dlirk, a little knock off of his underwear obsession. s� se�or... by control machete is a PIMPIN song... dunno if that's what you were thinking of. probably not. oh well download it anyways and congrats elf dude. dlirk, you forgot to say: 1st post! OMG 87 say something else than "I hate account sharers!" dafish, is it a joke..? 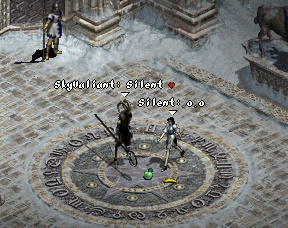 what are you talking about with RO beta server..
congrats SkyValiant.. but bananas are so much greater than apples in every aspect..
do you need some res scrolls? UHHHHH...Since when are banana's NOT HEALTHY?!?!?!? 1 of a kind elf ^^~ congratz! Why the heck would you make a Wisdom elf?